Have you ever watched ducks or fed them at a pond or lake? Then you know that ducks are adorable and almost friendly. If they see you with food, they’ll follow you or even peck at you! Ducks are found in every part of the world, except Antarctica. These water fowl are expert swimmers and divers. Their feathers are designed to keep them warm. Male ducks are usually brightly colored with green or chestnut brown throats. Females are brown all over. An interesting thing all about ducks. Ducks can see well underwater. 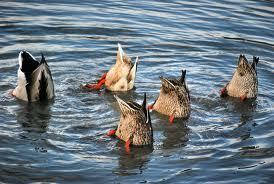 Ducks eat grain, seeds, nuts, fruit, insects, water plants and even small fish. Ducks are social. They live in groups called rafts or teams. Male ducks are called drakes. Females are called hens. Babies are ducklings. 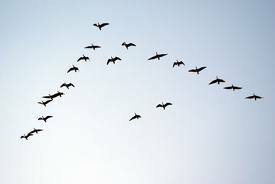 Ducks fly in a “V” shape. This shape makes flying easier. 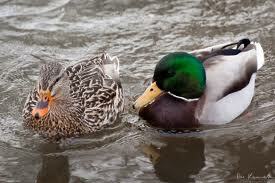 Ducks can see well underwater and can eat water plants and even small fish. A documentary video about the lives of ducks. Question: Do male and female ducks look the same? Answer: Male ducks are usually brightly colored with green or chestnut brown throats. Females are brown all over. Question: Do ducks build nests? Answer: Ducks usually lay their eggs in nest boxes, holes or burrows high in trees. Enjoyed the Easy Science for Kids Website all about Ducks info? Take the FREE & fun all about Ducks quiz and download FREE Ducks worksheet for kids. For lengthy info click here. Declan, Tobin. " Fun Duck Facts for Kids ." Easy Science for Kids, Apr 2019. Web. 20 Apr 2019. < https://easyscienceforkids.com/all-about-ducks/ >.